When you look at the popular sitcoms; Friends, How I Met Your Mother, The Big Bang Theory etc., you can instantly say which characters from these respective shows are the most adulated. For instance, I can say with confidence that of the aforementioned shows, Joey Tribbiani, Barney Stinson and Sheldon Cooper are the most popular among the masses. But why does the common viewer find them so engaging? 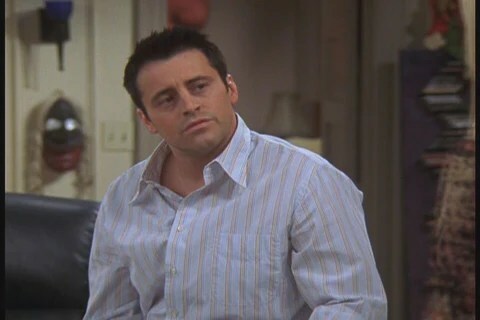 Popular… Joey is one of TV’s most favoured characters despite his many personality flaws. If I run with the three characters I’ve already selected then we can see huge flaws in each’s personality. Starting with Joey, he is moronic, selfish and gluttonous. He often acts with little thought for consequence and goes in to Monica & Chandler’s apartment with the sole intention of gorging himself on their inventory. Barney Stinson is similarly self-centered. He also shows signs of narcissism not to mention his horrendous promiscuity, a characteristic he shares with Joey too. Sheldon is not comparable with either predecessor in that way, but from what I have seen of The Big Bang Theory (which isn’t that much), he is conceited and cold towards people, even his friends. For all their criticisms, these characters each have positives to go with them but it certainly does make you wonder whether the average viewer would warm to them as much if they knew them in real-life. I do actually like Barney’s character for the most part and can see why people are drawn to this larger-than-life, abnormal persona that they present – entertainment. But at the same time, isn’t it kind of irresponsible to promote such negative personality traits? Authentic… Lynette’s palpable realism is not rewarded in fans. Like I say, I do like some of these popular characters but in all honesty, I tend to favour the underdogs of television. A list of some of my favourite TV characters in recent times consists of Super Claire Dunphy, Lynette Scavo, Edie Britt, Jane Kerkovich-Williams, Robin Scherbatsky. What do you notice? All female, all usually unpopular. Now, I don’t really think gender has any dictation on my preference of TV character – it’s merely a coincidence. But what I do see from this list is realism. These could all be real people. If I walk down the street, I could easily bump in to one of these characters. I’m not going to come across a suit worshipper, a ridiculously imbecilic lothario or a big-headed physics snob. Personally, I like to be able to relate to the characters on screen, I like to see myself and others in them. Lynette Scavo and Claire Dunphy are frighteningly realistic and could represent 70% of mothers in Western society, something that cannot be said of their eccentric co-stars. Other characters such as Edie Britt and Robin Scherbatsky, although presented as strong independent women have so much depth and vulnerability especially for two shows that rely on comedic elements. To be frank, I can’t really fathom why these brain-dead, offbeat types are preferred to the brilliantly observed realistic characters on the box. I think you have to appreciate how much harder it is to write a character in a relatable way. It’s easy to exaggerate mannerisms and actions of a character to the point it becomes ridiculous but to pair the dramatic twists and turns of the small screen with believable characters is well and truly skillful. In fact, it’s a surprise in a generation fascinated by reality TV that these characters are less welcomed but maybe it’s because we hate the fact that these characters remind us… of us. In honour of the passing of Desperate Housewives I have compiled a list of my top 5 episodes. In the ultimate ‘disaster episode’ of the series. The street is rocked by a riot that erupts due to Paul Young’s plan to introduce a half-way house on to Wisteria Lane. In the resulting fracas, Susan is badly trampled and Paul Young is shot. Riot… Susan is crushed by protesters. You know it’s a good pilot when a major character is dead within the opening sixty seconds and that’s what happens when Mary Alice’s warm commentary opens up an 8-year-journey packed with scandal, secrets and desperation. First meeting… the housewives toast Mary Alice. In the show’s first ever ‘disaster episode’. Carolyn Bigsby holds a cluster of people hostage in a supermarket including Lynette Scavo and Julie Mayer. This episode is packed with tension and drama, particularly during the death of Nora Huntingdon. However, this episode is perhaps most memorable for the most chilling scene of the series, Lynette’s final dream of Mary Alice. Wronged… Carolyn Bigsby prepares to shoot Nora. The penultimate episode on the countdown is that which follows the death of Edie Britt. This episode provides a unique look at one of the show’s most dimensional and entertaining characters before she is given a poignant send-off with the scattering of her ashes around Wisteria Lane. Pensive… Edie predicts her premature death. The winner of Desperate Housewives best ever episode goes to the 100th episode of the show. The episode is based around handyman, Eli Scruggs and the housewives’ remembering the things he did to help them before he died. The show incorporates charming flashbacks tying previous storylines together in a wonderful self-praising sixty minutes. Handyman… Mary Alice meets Eli Scruggs. Desperate Housewives signed off after a successful 8-year-reign on ABC with it’s 2 hour finalé which aired in the States last night. The show is often credited for ‘changing television history’ and is constantly praised as ‘iconic’. You’d think having started off with a bang (the suicide of Mary Alice Young) the finale would go out in the same manner? Well it didn’t, it went with a pathetic whimper. The show has been declining in the ratings for years and after the dross, Marc Cherry served up last night. It was almost complimentary for the series finalé to have averaged 11.23 million viewers (40 million less than ‘Friends’). Bree’s trial is in full swing and more and more evidence is being stacked against her; Ben is reluctant to answer any questions and Renee’s testimony reveals that she saw Bree return from the woods after she had buried Alejandro. Gaby and Carlos are preparing to reveal the truth when Karen McCluskey overhears and subsequently ‘confesses’ to killing Alejandro in what can only be described as the best moment of the finalé. Bree spends the second hour spurring the advances of her lawyer, Tripp only for her to go back on her decision and settle (I stress that) with her final love interest. Susan spends the first hour serving no real purpose. It is revealed that she is hoping to move away from Wisteria Lane sooner rather than later and Lee has already been enlisted to help her sell. Despite, the odd attempt to hide her plans from her friends she is merely a bystander for the first hour. During the second hour, Susan is seen frantically rescuing her daughter from giving birth in the back of a limousine and spends a solitary couple of minutes pondering her future with her daughter, Julie. Lynette’s storyline is perhaps the most predictable albeit necessary of the episodes. She finally gets back together with Tom to close part 1 – ‘Give Me The Blame’. She is then slapped with a CEO job offer in New York from returning, Katherine Mayfair. She ponders the decision and after a run-in with the same woman she runs in to in the supermarket from the pilot. However, she realises that Tom and her family are all she needs to be truly happy, a delightful coming together for the show’s most realistic character. Gaby spends the finale as we’ve become accustomed to seeing her in the last few seasons; quietly cracking jokes and mischievously pushing the plot along. Her ending is like Lynette’s, anticipated but appropriate. The viewers are treated to a happy ending in which Carlos and Gaby quietly bicker in to their old age, but they don’t have a particularly big part to play in the finale. Elsewhere on the lane, the writers devote far too much time to Renee Perry and her wedding. ‘Edie Lite’ is seen on screen perhaps as much as the four main characters. Something, I thought inappropriate for a series finale. In direct contrast, the death of Karen McCluskey was treated with grace and dignity. With all this going on it’s easy to forget the delightful first meeting of Martha Huber and Mary Alice at the start of ‘Finishing the Hat’. It was just what the finale needed to boost any absent feeling of nostalgia. However, in what could have been described thus far as a more than satisfactory series finalé. Marc Cherry left his audience not with a tingling down the spine but more a tingling slap to the face as a great TV show was dealt the injustice of this poor coup de grâce. 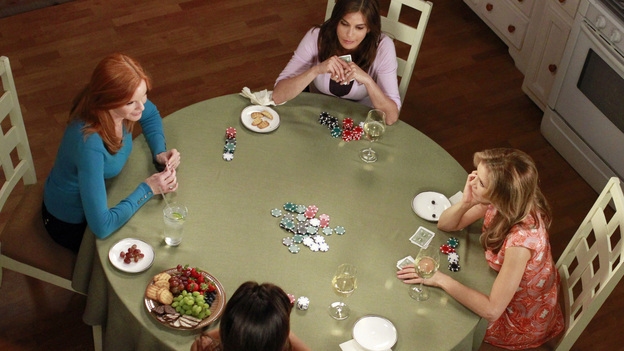 The final scenes depicted the four girls having their last ever poker game before vowing to keep in touch, however it is swiftly revealed that this promise was in vein. Omniscient narrator, Mary Alice then treats us to three flash-forwards revealing that Lynette moves to New York with Tom and the pair go on to have six grandchildren. Gaby opens her own shop and becomes a presenter for the Home Shopping Network and Bree moves to Louisville with Tripp, where she is eventually voted on to the State Legislature. There is no denying that these endings are apt for where the characters started back in 2004. Lynette reaches the top of the corporate ladder, Gaby and Carlos are living the high life in a Californian mansion and Bree is paraded as the proud Republican she is. Overlooked… Mary Alice didn’t wrap up proceedings. Lynette and Tom were reunited. The conclusion of Lynette’s journey as a character. The inclusion of Martha and Mary Alice’s first meeting. The exclusion of Lynette, Gaby and Bree in the ultimate scene. Ending on a cliffhanger rather than a poignant Mary Alice quote. The girls leaving Wisteria Lane. The unnecessary re-brand of Katherine’s character. 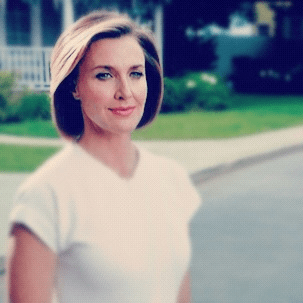 Not enough Mary Alice Young – The show didn’t come full circle. The absence of Edie Britt, one of the show’s most popular characters. The rushed, contrived and poorly elaborated finish. Episode rating: 6/10 – I was expecting a lot better. Perhaps because it was a series finalé and my expectations are high or maybe because Marc Cherry has known how it was going to end for 8 years and he never realised just how awful his plan was.